Description: Clip Art Photo Of U.S. Air Force Senior Amn. 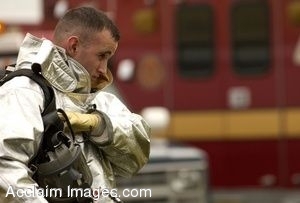 Kent McGaha, a firefighter with 125th Fighter Wing, Florida Air National Guard, suits up to triage and recover victims during the tri-annual mass casualty exercise at the Jacksonville International Airport, Fla., Oct. 18, 2006. (U.S. Air Force photo by Staff Sgt. Shelley Gill). Stock photography by Department of Defense Public Domain.